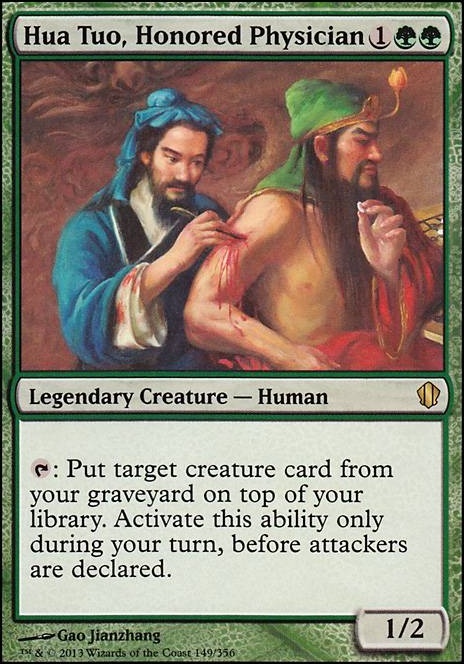 Hey friend, in my own Xenagod deck, I just traded out my Feldon of the Third Path for Hua Tuo, Honored Physician . I have yet to really test it much, but for the cost of a little speed I've found it to be a little more reliable. 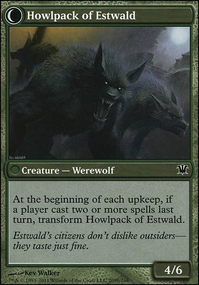 Not by much though, just for the fact that you actually get the creature back instead of just a copy. 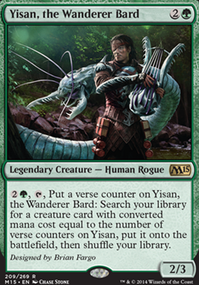 Yavimaya Hollow is a nice recursion option. 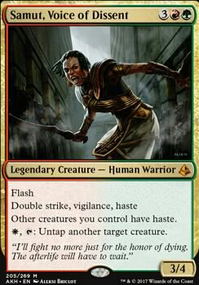 We also like Hua Tuo, Honored Physician ; especially when combo'd with Vizier of the Menagerie . 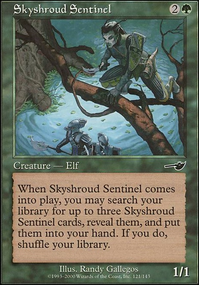 Not super keen on Golgari Findbroker due to its CMC but its OK here, esp. 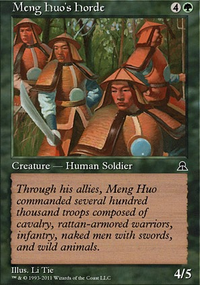 since you got a lot of enchantments and like saccing lands (otherwise I'd ask you to reconsider Hua Tuo, Honored Physician ). The rest are fine too. livingrock on Gishath hungry! Gishath want eat! Caltrops is good if you are emphasizing Enrage. I think your use of Hua Tuo, Honored Physician here is clever. 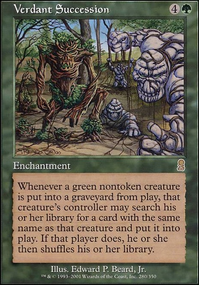 You can use Noxious Revival for the same effect, and if Gishath dies in combat you can cast it as a response to put her on top of your deck from the graveyard so she hits the field from your own trigger. I would cut Harmonize . 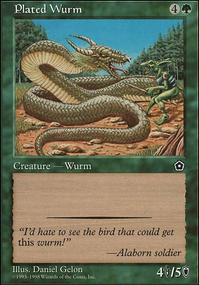 You're going to be thinning out your deck so much with Gishath triggers that I don't feel the deck needs a ton of draw. Just imo. @osbert: Yeah someone made me discard my hand with Experiment Kraj in it and I was like WELP. Definitely need recursion. 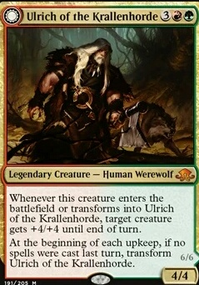 It's a fun deck but I wonder if Kraj just shouldn't be my Commander. Probably need a Worldly Tutor at any rate. I took Bred for the Hunt out because it seemed to conditional. I've got 11 cards with some sort of card draw. Maybe I need better options. 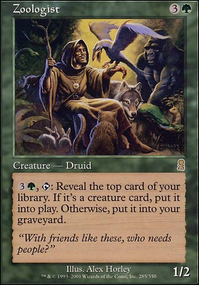 Guardian Project , Lifecrafter's Bestiary and Beast Whisperer seem like a good ones. Maybe for Bramblewood Paragon and Tempest Caller and Chromatic Lantern . 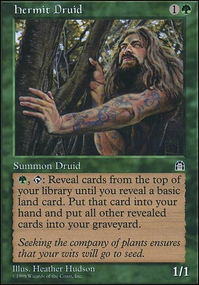 Love Regrowth and Seasons Past for recursion. 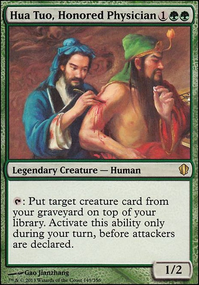 Might try Hua Tuo, Honored Physician . Reborn Hope seems OK too. You have Hua Tuo, Honored Physician in under performers? Every time I get him out, he does work for me. 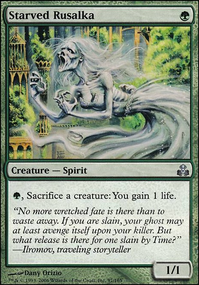 And I'm really glad to see someone else put Grim Flayer in this deck. 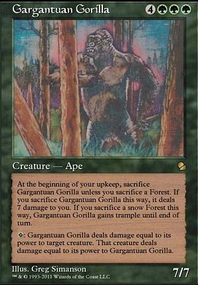 I was baffled at how few decklists included that one. It's always nice to see fresh ideas and Gishath always excites me! 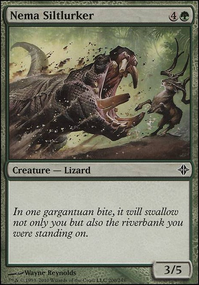 While I appreciate the idea of jamming every dinosaur you have in the deck, I would include some ways of manipulating the top of the deck, as well as more ways to protect the commander. This should be at the expense of some of the more lacklustre creatures. 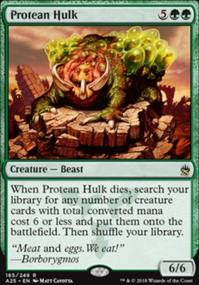 In addition to that, I would look to improve the deck's mana acceleration and card draw. 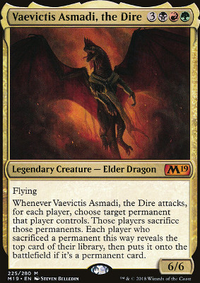 Without any further info concerning budget, your meta, and more importantly what is your vision for the deck I can't make a lot of suggestions, but here are a couple that are very budget friendly and can be very good in the deck! Suggestions: Cream of the Crop, Congregation at Dawn, Crown of Convergence, Hua Tuo, Honored Physician, Gods Willing, Redeem the Lost, Sheltering Light and others like them. 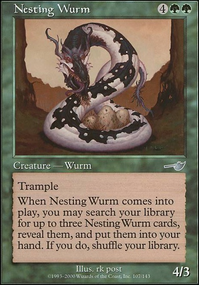 This is a very nice deck with lots of potential! Good job!